Last Fall, Pam from West Michigan Modern reached out to me over our home's Facebook page and asked if I'd be interested in chatting with her about our renovation and the history of the house. Of course I jumped at the chance to chat more, and in mid-December she showed up for a cup of coffee. As you can imagine, we instantly hit it off. Pam knows her stuff - she's a history buff and loves a good back story. I wanted to know about all the houses she had been in (and she knows them all...) and she wanted to know why in the world Greg and I moved to Grand Haven to embark on this project. This initial meeting inspired me to dig more into the history of our house, which I wrote about back in January. Because of Pam, I've come to love "digging a bit deeper" and trying to investigate. 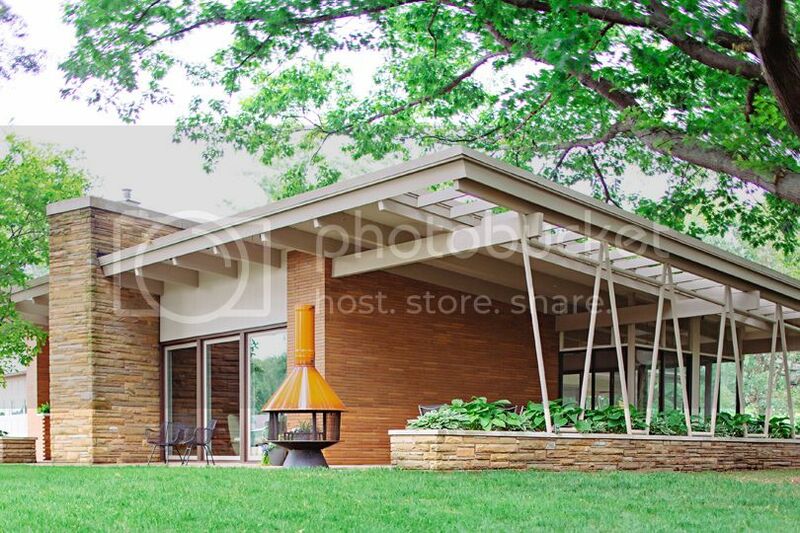 While I LOVE the preserved, original details and authentic, mid-century design, I also want to know why the original owner built the home, who built it for them, and how they enjoyed living there. As Pam was departing from our first meeting in December, I told her I know a seasoned event planner who wouldn't mind planning an annual home tour in our area. :) Her ears perked up, but she had a lot on her plate, so we didn't discuss too much in detail until Spring. I've always wanted a scooter, and this year it finally made sense to get one. We live in a lot smaller town where scooter travel is very common in the warmer months, so I can get all over town using minimal gas and taking up less space in the driveways I pull into. 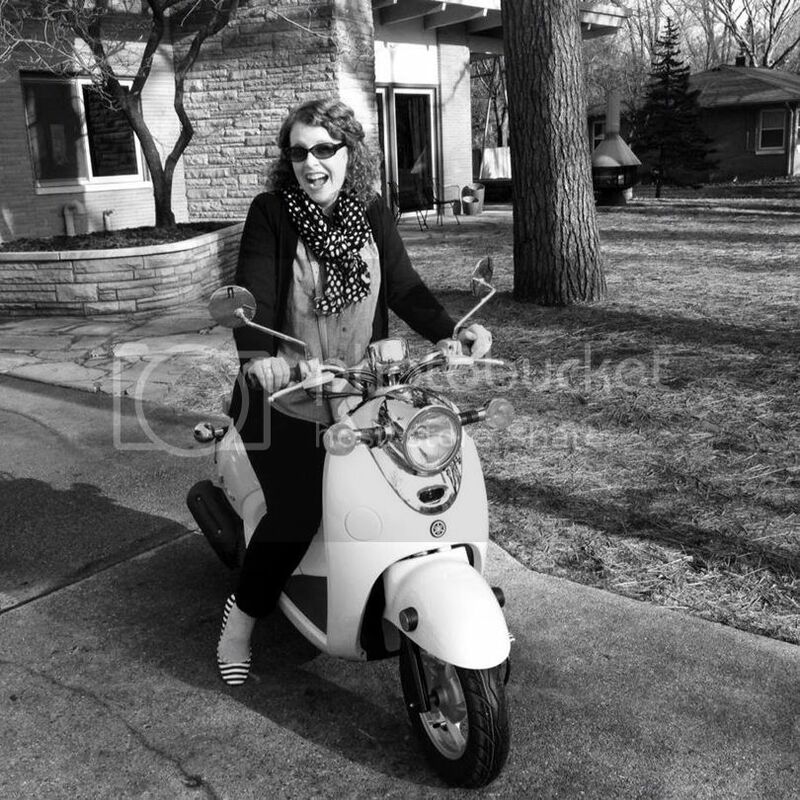 Pam shared a little about my scooter adventures on her blog recently, so feel free to check out her write up as well. It includes some more photos of houses we hope to be on tour in 2015! I will tell you knocking on doors and having conversations with people who are NOT expecting me has put me completely out of my comfort zone, but at the end of the day, I usually get a story and feel like I've connected with someone, at least about their home and how cool I think it is. All of this door-knocking, digging into the history of homes, and watching the MLS like a hawk for new MCMs that pop up, has led to us planning a home tour in the Grand Haven area for 2015. It's going to take a lot more scheming before I have a full line up of people ready to offer their home interiors up to the public, but I feel that I'm making progress. I can tell you one house that will certainly be on the first West Michigan Modern // MidModMich Home Tour with be the ole' MidModMich house! That's right, our house will certainly be one of the homes on tour. I'm hoping to have a least ten local houses on tour, a few more possibly "drive-bys", and a couple of commercial buildings, including the local Alden B. Dow church. It's hard to slow down on the planning side of things - I have some pretty big ideas for our small MCM community, and presenting the ideas, along with all of logistics of how I anticipate things to work to homeowners and local businesses is just getting started. Right now I'm thankful for all the home tours I've personally been on to draw inspiration from. We certainly don't have enough (yet!) for 15 days of fun like Modernism Week in Palm Springs, but I do believe we have more than enough for something like the Dwell Home Tours in Los Angeles I recently enjoyed. And like Modernism Week, I'd love to work in some social events (for homeowners, as well as attendees) as well as the actual home tour portion. I personally LOVE mingling with other mid-century modern enthusiasts, and hope that we can bring a lot of MCM-lovers (from near & far!) to our little Michigan town in 2015. More details to come as they firm up - I'll keep you posted!